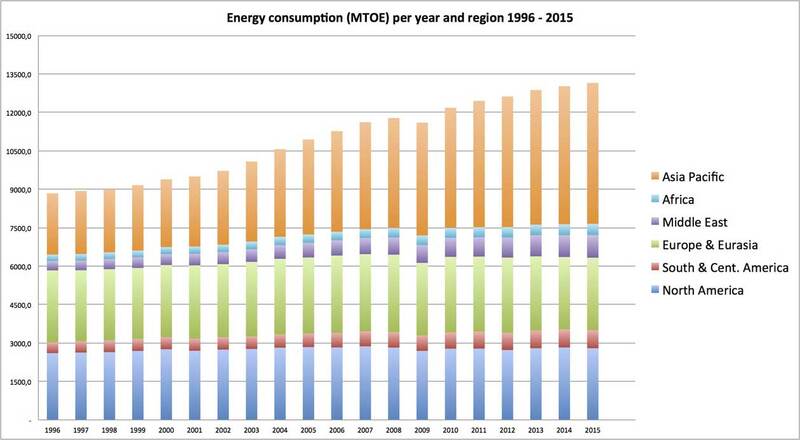 The below charts provide data for global primary energy consumption measured in million tonnes oil equivalents (MTOE) per year, type and region during the period 1996 to 2015. 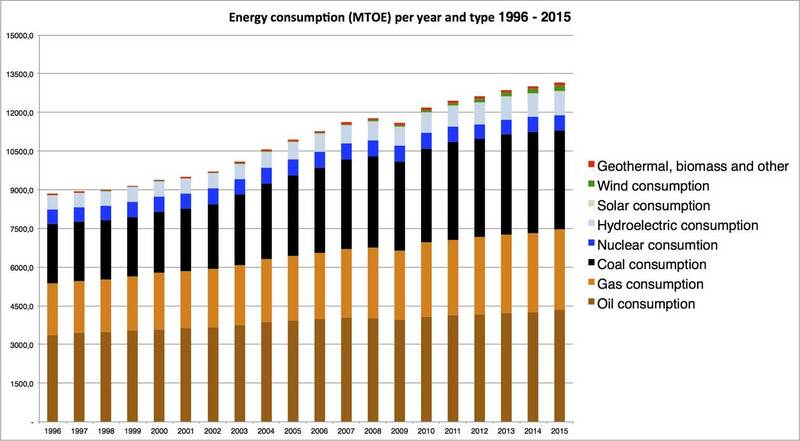 The primary energy values (MTOE) used for nuclear electricity generation, hydroelectric generation and electricity from renewable sources, takes into account the efficiency of converting fossil fuels (Oil) into electricity. 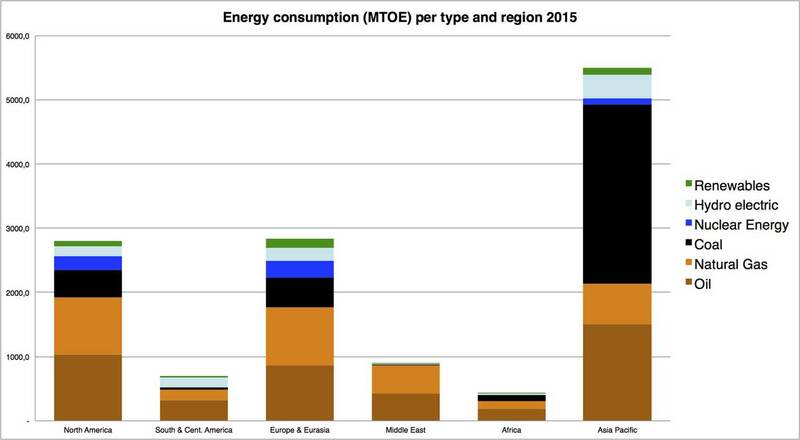 The primary energy values (MTOE) have been derived by calculating the equivalent amount of fossil fuel required to generate the same volume of electricity in a thermal power station, assuming an average conversion efficiency of 38%. One million tonnes of oil or oil equivalent produces about 4400 gigawatt-hours (=4.4 terawatt hours) of electricity in a modern power station. 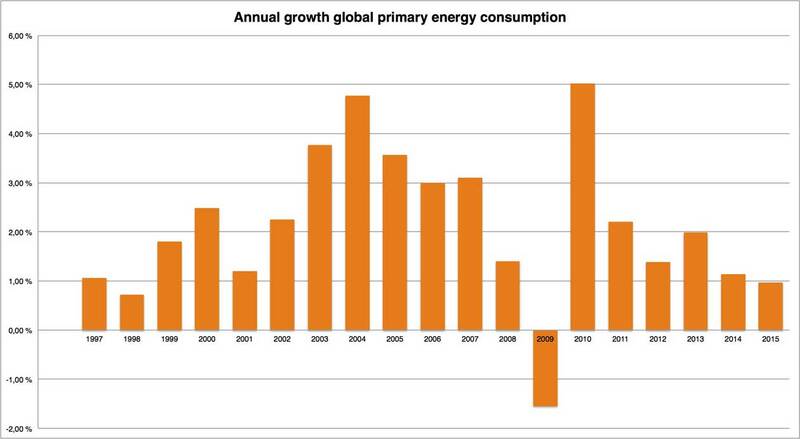 Fuels used as inputs for conversion technologies (gas-to-liquids, coal-to-liquids, and coal to gas) are counted as production for the source fuel and the outputs are counted as consumption for the converted fuel. Caribbean (including Puerto Rico and US Virgin Islands), Central and South America. Austria, Belgium, Czech Republic, Denmark, Estonia, Finland, France, Germany, Greece, Hungary, Iceland, Ireland, Italy, Luxembourg, Netherlands, Norway, Poland, Portugal, Slovakia, Slovenia, Spain, Sweden, Switzerland, Turkey, United Kingdom, Albania, Bosnia-Herzegovina, Bulgaria, Croatia, Cyprus, The former Yugoslav Republic of Macedonia, Georgia, Gibraltar, Latvia, Lithuania, Malta, Montenegro, Romania and Serbia. Armenia, Azerbaijan, Belarus, Kazakhstan, Kyrgyzstan, Moldova, Russian Federation, Tajikistan, Turkmenistan, Ukraine, Uzbekistan. Arabian Peninsula, Iran, Iraq, Israel, Jordan, Lebanon, Syria. Territories on the north coast of Africa from Egypt to Western Sahara. Territories on the west coast of Africa from Mauritania to Angola, including Cape Verde, Chad. Territories on the east coast of Africa from Sudan to Republic of South Africa. Also Botswana, Madagascar, Malawi, Namibia, Uganda, Zambia, Zimbabwe. Australia, Brunei, Cambodia, China, China Hong Kong SAR*, China Macau SAR*, Indonesia, Japan, Laos, Malaysia, Mongolia, New Zealand, North Korea, Philippines, Singapore, South Asia (Afghanistan, Bangladesh, India, Myanmar, Nepal, Pakistan and Sri Lanka), South Korea, Taiwan, Thailand, Vietnam, Australia, New Zealand, Papua New Guinea and Oceania.